Dan Vergano of USA Today reports on an “all faculty” announcement from George Mason University concerning the outcome of two faculty committee investigations of plagiarism charges against GMU statistics professor Edward Wegman. One investigation concerned a 20o8 article by Wegman protege Yasmin Said, Wegman himself and two others in Computational Statistics & Data Analysis (CSDA). The committee upheld CSDAs previous plagiarism finding; as “team leader”, Wegman was found to bear responsibility and has been asked to retract the article and apologize to CSDA’s editor. 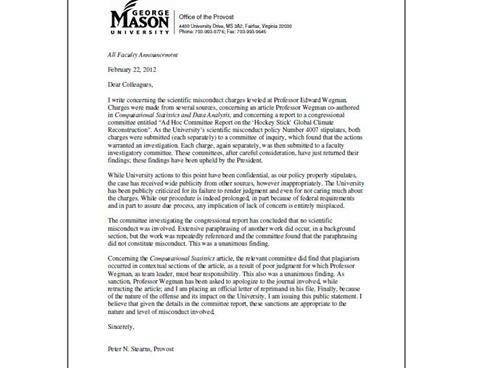 GMU has also issued an official letter of reprimand confirming that finding of research misconduct. A separate GMU committee investigated the 2006 congressional report commonly known as the Wegman Report, a critique of the Mann-Bradley-Hughes “hockey stick” reconstruction. That investigation held that “no scientific misconduct was involved”, only “extensive paraphrasing of another work” that was “referenced repeatedly”. [That finding holds that there was no plagiarism in Wegman Report background material derived from Raymond Bradley’s Paleoclimatolgy; readers may judge side-by-side comparisons of the passages on tree-rings and ice core and coral proxies for themselves]. However, in a bizarre twist, it appears that the committee did not even consider side-by-side comparison of the Wegman Report’s long and unreferenced background section on social network analysis, part of which was reused in the later CSDA article and gave rise to the plagiarism finding in the other GMU case! In the wake of the leak of several apparently official documents from the Heartland Institute (along with one highly disputed two-page memo), much speculation has focused on the identity of an anonymous donor who has reportedly donated more than $13 million to Heartland in the last six years. DesmogBlog today released an archive of Heartland Institute budget and strategy documents apparently leaked by someone with high level access. An anonymous donor calling him (or her)self “Heartland Insider” has released the Heartland Institute’s budget, fundraising plan, its Climate Strategy for 2012 and sundry other documents (all attached) that prove all of the worst allegations that have been levelled against the organization. The documents give a clear picture of Heartland money flows, showing exact amounts being paid to Heartland employees, and more importantly, the scientists involved in the ongoing NIPCC effort to disrupt the forthcoming IPCC AR5. Heartland’s list of major projects also includes a new K-12 “global warming curriculum”. The curriculum will promote the idea that anthropogenic climate change is a “major scientific controversy”, and seems to steer clear of the actual science. Dr. Wojick proposes to begin work on “modules” for grades 10-12 on climate change (“whether humans are changing the climate is a major scientific controversy”), climate models (“models are used to explore various hypotheses about how climate works. Their reliability is controversial”), and air pollution (“whether CO2 is a pollutant is controversial. It is the global food supply and natural emissions are 20 times higher than human emissions”). This “teach the controversy” approach (as opposed to teaching the actual science) seems similar to the anti-science effort of the Fraser Institute a couple of years back. And most of Heartland’s funding sources have now been laid bare, with the notable exception of the tightly guarded identity of a single “anonymous donor” who has given $13 million over the last five years. Other donors range from the Charles Koch foundation down through several recognizable tobacco and pharmaceutical companies, and even Microsoft. Here are three two of the most important released documents, with some highlights from each. The Fraser Institute recently issued a report on Canadian air quality that achieved moderate coverage, but little critical scrutiny (apart from a devastating critique from the Suzuki Foundation). In Canadian Environmental Indicators – Air Quality, Fraser Senior Economic Researcher Joel Wood claims that concentrations of five major pollutants, including the particularly worrying duo of fine particulate matter and ground level ozone, are in decline. Wood even accuses ENGOs and the Canadian Medical Association of trying to “scare” the public with claims that are “exaggerated or outright wrong”, particularly in their concerns about ozone. But in a shocking development (or perhaps not), it turns out that Environment Canada’s official air quality indicator for ozone shows a statistically significant worsening over the last two decades, while both fine particulate matter and ozone show no significant trend in the last decade. The Environment Canada indicators, the very existence of which appears to have been totally missed by Wood and the various reviewers of his work, are based on complete warm season averages weighted by population, and thus provide a much better indicator than Wood’s ad hoc analysis. This same ineptitude can also be seen in Wood’s short climate policy analyses, where he gets the basics totally wrong, while questioning the validity of climate science itself. Thus the ignorance, incompetence and bias of Canada’s self-styled “leading public policy think tank” is demonstrated once again. Here are a couple of items currently in the news. Fallout from the Wall Street Journal 16 op-ed continues. The Journal printed a response from actual climate scientists, apparently drafted by NCAR scientists Kevin Trenberth. Meanwhile Patrick Michaels weighs in at Forbes. There are many other takedowns of the WSJ 16 piece out there; here is one from Media Matters. There has also been a ragged rollout of the plan for a more rigourous oil sands monitoring program, with attendant confusion about whether there will be independent governance. As far as I can tell, Alberta is willing to go along with this in order to ensure the program’s credibility, but the federal environment minister Peter Kent seems cool to the idea.